Cloud Hosted Router (CHR) is a RouterOS version intended for running as a virtual machine. It supports the x86 64-bit architecture and can be used on most of the popular hypervisors such as VMWare, Hyper-V, VirtualBox, KVM and others. CHR has full RouterOS features enabled by default but has a different licensing model than other RouterOS versions. Warning: Hypervisors that provide paravirtualization are not supported. Note: SCSI controller Hyper-V and ESX is usable just for secondary disks, system image must be used with IDE controller! Warning: We do not recommend using E1000 network interface if better synthetic interface options are available on specific Hypervisor! We provide 4 different virtual disk images to choose from. Note that they are only disk images, and you can't simply run them. Please note that running CHR systems can be cloned and copied, but the copy will be aware of the previous trial period, so you cannot extend your trial time by making a copy of your CHR. However, you are allowed to license both systems individually. To make a new trial system, you need to make a fresh installation and reconfigure RouterOS. 60-day free trial license is available for all paid license levels. To get the free trial license, you have to have an account on MikroTik.com as all license management is done there. Perpetual is a lifetime license (buy once, use forever). It is possible to transfer a perpetual license to another CHR instance. A running CHR instance will indicate the time when it has to access the account server to renew it's license. If the CHR instance will not be able to renew the license it will behave as if the trial period has ran out and will not allow an upgrade of RouterOS to a newer version. After licensing a running trial system, you must manually run the /system license renew function from the CHR to make it active. Otherwise the system will not know you have licensed it in your account. If you do not do this before the system deadline time, the trial will end and you will have to do a complete fresh CHR installation, request a new trial and then license it with the license you had obtained. p1 (perpetual-1) license level allows CHR to run indefinitely. It is limited to 1Gbps upload per interface. All the rest of the features provided by CHR are available without restrictions. 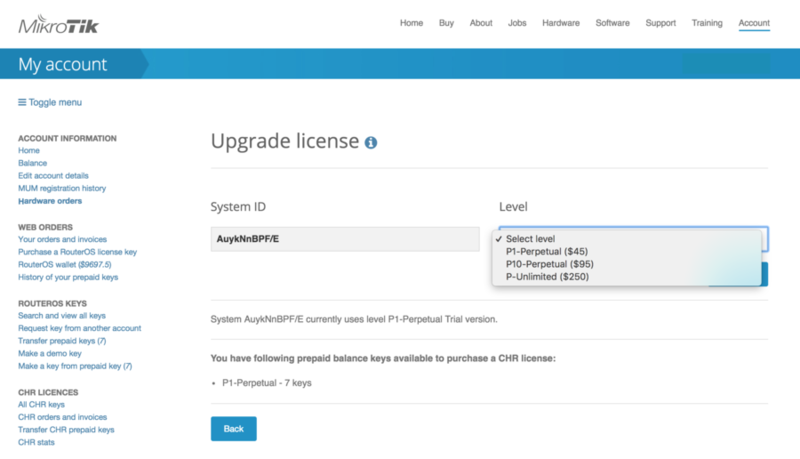 It is possible to upgrade p1 to p10 or p-unlimited After the upgrade is purchased the former license will become available for later use on your account. p10 (perpetual-10) license level allows CHR to run indefinitely. It is limited to 10Gbps upload per interface. All the rest of the features provided by CHR are available without restrictions. It is possible to upgrade p10 to p-unlimited After the upgrade is purchased the former license will become available for later use on your account. The p-unlimited (perpetual-unlimited) license level allows CHR to run indefinitely. It is the highest tier license and it has no enforced limitations. There are several options to use and try CHR free of charge. The free license level allows CHR to run indefinitely. It is limited to 1Mbps upload per interface. All the rest of the features provided by CHR are available without restrictions. To use this, all you have to do is download disk image file from our download page and create a virtual guest. In addition to the limited Free installation, you can also test the increased speed of P1/P10/PU licenses with a 60 trial. You will have to have an account registered on MikroTik.com. Then you can request the desired license level for trial from your router that will assign your router ID to your account and enable a purchase of the license from your account. All the paid license equivalents are available for trial. A trial period is 60 days from the day of acquisition, after this time passes, your license menu will start to show "Limited upgrades", which means that RouterOS can no longer be upgraded. If you plan to purchase the selected license, you must do it within 60 days of the trial end date. If your trial ends, and there are no purchases within 2 months after it ended, the device will no longer appear in your MikroTik account. You will have to make a new CHR installation to make a purchase within the required time frame. To request a trial license, you must run the command "/system license renew" from the CHR device command line. 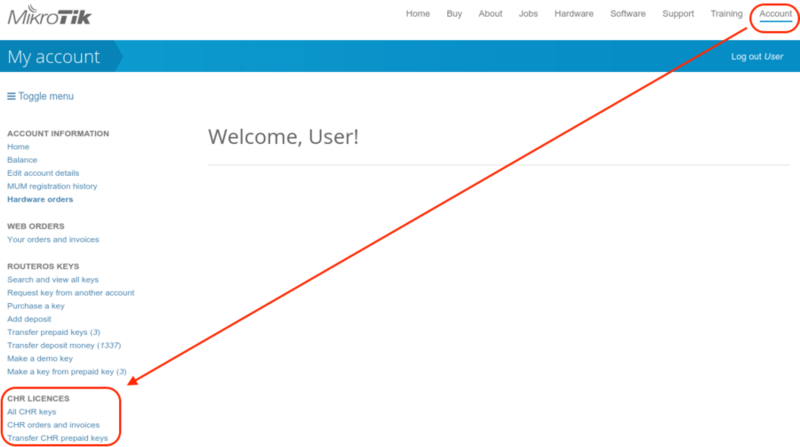 You will be asked for the username and password of your mikrotik.com account. After the initial setup a CHR instance will have a free license assigned. From there, it is possible to upgrade the license to a higher tier. Once you have a trial license all the work with the license is done on the account server where it is possible to upgrade license to a higher tier unless it is p-unlimited already. To acquire a higher level trial, set up a new CHR instance, renew the license and select the desired level. It is possible to pay using account balance (deposit), credit card (CC), PayPal or using Balance (prepaid) key (if you have any). 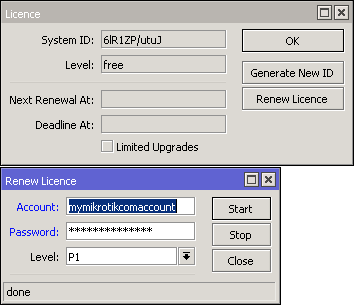 In '/system license' menu router will indicate the time next-renewal-at when it will attempt to contact server located on licence.mikrotik.com. Communication attempts will be performed once an hour after the date on next-renewal-at and will not cease until the server responds with an error. If deadline-at date is reached without successfully contacting the account server, the router will consider that license has expired and will disallow further software updates. However, router will continue to work with the same license tier as before. VMware ESXi supports MTU of up to 9000 bytes. To get the benefit of that, you have to adjust your ESXi installation to allow a higher MTU. Virtual Ethernet interface added after the MTU change will be properly allowed by the ESXi server to pass jumbo frames. Interfaces added prior to MTU change on the ESXi server will be barred by the ESXi server (it will still report old MTU as maximum possible size). If you have this, you have to re-add interfaces to the virtual guests. If Linux bridge supports IGMP snooping, and there are problems with IPv6 traffic it is required to disable that feature as it interacts with MLD packets (multicast) and is not passing them through. The problem: after configuring a software interface (VLAN, EoIP, bridge, etc.) on the guest CHR it stops passing data to the outside world beyond the router. The solution: check your VMS (Virtualization Management System) security settings, if other MAC addresses allowed to pass if packets with VLAN tags allowed to pass through. Adjust the security settings according to your needs like allowing MAC spoofing or certain MAC address range. For VLAN interfaces, it is usually possible to define allowed VLAN tags or VLAN tag range. In some of hypervisors before Vlans can be used on VMs they need to first be configured on hypervisor it self. Enable Promiscuous mode in port group or virtual switch that you will use for specific VM. It wont be possible to run CHR on this hypervisor. CHR cannot be run as paravirtualized platform. When creating multiple Linodes with the same disk size, new Linodes will have the same systemID. This will cause issues to get a Trial/Paid license. To avoid this, run the command /system license generate-new-id after the first boot and before you request a trial or paid license. This will make sure the ID is unique. poweron and resume scripts are executed (if present and enabled) after poweron and resume operations respectively. poweroff and suspend scripts are executed before poweroff and suspend operations respectively. Guest filesystem quiescing is performed only if requested. Networking, disk, and OS info is reported to hypervisor every 30 seconds (GuestStats (memory) are disabled by default, can be enabled by setting 'guestinfo.disable-perfmon = "FALSE"' in VM config). The order, in which network interfaces are reported, can be controlled by setting 'guestinfo.exclude-nics', 'guestinfo.primary-nics' and 'guestinfo.low-priority-nics' options. Standard wildcard patterns can be used. After using GuestProgramSpec together with an instance of GuestAuthentication as arguments to StartProgramInGuest unique JobID is obtained. Base-64 encoded strings written to (domain local) xenstore path ('vm-data/provision/script') are decoded and interpreted a script-text. Status ('ready', 'running', 'error') is reported in 'vm-data/provision/script/status'. Scripts are accepted only if 'status' != 'running'. Base 64 encoded script output (if any) is written to 'vm-data/provision/script/otuput'. QEMU guest agent is available. Supported agent commands can be retrieved by using guest-info command. Host-guest file transfer can be performed by using guest-file-* commands. Guest networking information can be retrieved by using the guest-network-get-interfaces command. qm set $vmid --args "-chardev 'socket,host=$hostip,port=$portnum,id=chr-agent,server,nowait' -device 'virtio-serial,bus=pci.0,addr=0x9' -device 'virtserialport,chardev=chr-agent,name=chr.provision_agent'"
#  - large chunk sizes may slow down guest-side parsing. #  - small chunk sizes result in additional message fragmentation overhead. # Default value is a guestimate. GuestAgent using unix/tcp sockets for communication. This page was last edited on 1 February 2019, at 16:18.